Brand New LED Rope Lighting, Highly durable, Weather-proof, Round, Clear, PVC rope, with Long-life, Cool-burning, Energy-saving, Sub-miniature, LED bulbs. Flexible to bend into shapes. No Flicker/Smooth Glow. Can be cut approx. every 4 inches. Easily Installed. For Indoor or Outdoor use. Used for anywhere soft incandescent lighting is needed such as Decorative Lighting, Sign Lighting, Corners, Ceilings, Staircases, Decks, Driveways, Boats, Galleries, Clubs, and Parties. Rope Light cut to desired length. The LED lights sold in this listing are 12 Volt DC LED lights. They are designed to be connected to a 12V DC power source such as a 12V battery. DO NOT attempt to connect or plug these lights into a 110V power outlet such as a standard wall outlet found in your home as it will burn these lights out and void the returns policy. LED lights that are designed to be plugged into a standard North American wall outlet need to be 110-120 Volts. 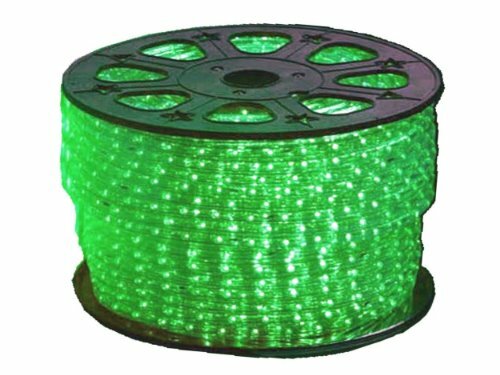 We do sell 110 Volt LED rope lights in our store.